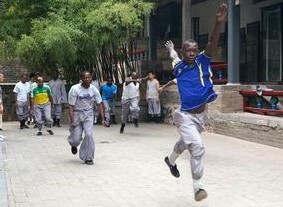 Running exercise is a kind of physical exercise Shaolin Kung fu used most often, which is the main technical requirements for running a simple because, without special venue, clothing or equipment. Whether in the field or in the street, even in the fields, woods are running exercise. They can control the running speed, distance and route. Running is a door knowledge, can exercise the most scientific method to achieve the best results. Running action essentials -- remain stable head and shoulder. Head to being in front of, unless the uneven road, not forward, watching in front of two. Shoulders relax, avoid chest. Dynamic stretching -- shrug. Drooping shoulders relaxed, then as the towering, stop, repeat after the restore. Running action essentials -- arm shoulder axis should be based around the action, about range of motion does not exceed the body midline. The finger, wrist and arm should be relaxed, elbow angle of about 90 degrees. During pre swing slightly inward, the backswing and slightly outward. Dynamic stretching -- elbow out arm. Arms one after another into pre start position, a rear swing arm elbow to raise, then relax before. With the action more lift when the higher speed. Running action essentials -- from the neck to the abdominal upright, not leaning forward (unless the acceleration or uphill) or backward, so conducive to breathing, balance and stride. Trunk sway up and down or not too big. Front leg swinging active hip push, running to the attention of hip rotation and relaxation. Dynamic stretching -- the leg. Before and after the legs open, and shoulder width, the body center under pressure to slow muscle tension, then relax reduction. Trunk always keep upright. Running action essentials -- waist to maintain the natural upright, not too straight. Muscle a little nervous, maintain the trunk posture, and pay attention to the impact of buffer feet. Dynamic stretching -- body flexion extension. Natural standing, legs open, and shoulder width. Trunk slowly bending forward to his hands drooping to tiptoe, hold for a while, then recovery. Running action essentials -- the thigh and knee hard before, instead of lifting. Any lateral movements of the legs are superfluous, but also easy to cause injuries to the knee, thigh pendulum to is so before. Dynamic tensile -- before the bow. Two station distance with hip width, hands behind your head. Forward from the hip pike. Keep the back straight, until the stock two myo nervous. Running action essentials -- foot should be about one foot in front of the location in the body, close to the midline. Cross leg not too far, avoid the Achilles tendon caused by excessive force and strain. At the same time to pay attention to the muscles and tendons in the ground cushion, landing leg should actively backward pawing, make the body forward. In addition, the calf before the direction should be positive, feet should as far as possible toward the front, don't valgus or otherwise back, knee and ankle joint injury prone. Running on the beach for reference check. Dynamic stretching -- supporting wall lift heel. Face to the wall about 1 meters standing, his arms extended in front of shoulder width, hands on the wall. Raise the heel, then down, feel the calf and Achilles tendon tension. Running action essentials -- if Overstriding, leg extended too far, in the heels, the brake force, a great damage to the bone and joint. The right landing with the middle of the foot on the ground, and let the impact force quickly spread to the whole foot. Dynamic stretching -- sitting ankle stretching. On his knees, hips near the heel, upper body upright. Slowly down to the ankle and the foot sole pressure until the extensor digitorum muscle tension was enough. And then lifting the buttocks after repeated. Action should be slow rhythm.